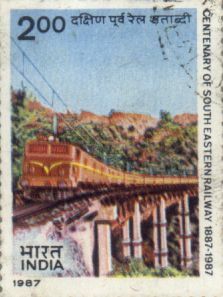 India Railway Indian Railways in Postal Stamps (1977-1988). Foreign mail arriving in Bombay. The First Asian International Stamp Exhibition briefly called ASIANA-77 was held from October 19 to 23, 1977. The Philatelic Congress of India organized the exhibition, with the active participation and assistance of the Indian Posts and Telegraphs Department and also the Government of Karnataka. The exhibition was exclusively for the Asian and Australasian countries and under the patronage of the Inter-Asia Philatelic Federation (FIAP) which is the Asian chapter of the Federation Internationale de Philatelic (FIP). Representatives from 7 European countries to safeguard the interests of stamp collectors at international level founded FIP in 1926. 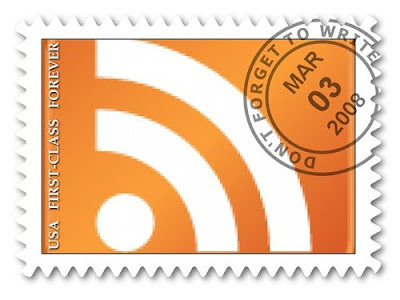 At present, there is hardly any National Philatelic Federation of a country, which is not affiliated, with the FIP. The FIP has set up standards rules for holding the International Exhibitions under their patronage. The FIP has categorized harmful, improper and undesirable stamp issues, which they have banned for exhibiting in any of the International Exhibitions under their patronage. 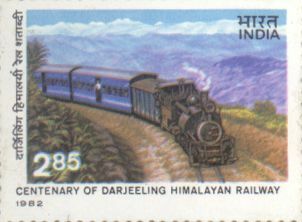 Centenary of Darjeeling Himalayan Railway. The snow peaks of the magnificent Himalayas have since time immemorial enchanted saints, pilgrims and tourists for various reasons. Railways, in their own way, have tried to 'ascend' the hills. The eternal Darjeeling-Himalayan Railway line having a two feet wide track, conceived by Franklin Prestage, the agent of the Eastern Bengal Railway, links Darjeeling to Siliguri, a distance of 87.48 Kms. A unique engineering feat passing through different climate zones offers a picturesque and science beauty. Laid on the famous Hill Cart Road, the Railway line appears to be playing hide seek with the road as they criss-cross each other at several places. The line between Sukna and Darjeeling is almost all along located on the road-bench, either skirting hillside or on the far edge of the road. The alignment passes through hills and gradually climbs up to the maximum altitude of 2,258 meters at Ghum. The honor of blazing the trail of the first railway train across the Alps, the first experiment for construction a hill railway, goes to Chega, an Austrian. He was the first to apply the principle of artificially lengthening the line by looping in order to flatten the gradient. The engineers of Indian Railways successfully applied the principle in constructing Darjeeling-Himalayan line thereby completely obviating the necessity of expensive tunnels. Another method adopted on the route is reversing a zigzag movement, each leg of this move being utilized to gain additional height, although this means the train moving backward on the central leg. The need for tunnels was completely obviated by means of 'loops' and 'reverses'. There are 4 loops of which the most renowned one is the Bastasia loop, 5 reverses in the shape of 'Z', 5 major and 498 minor bridges and 177 unmanned level crossings on the section. Around 90% of the length of track is on curves, the sharpest curve having a radius of 59 feet and steepest gradient of 1 in 22. The construction of the section began in 1878 and could be completed only in July, 1881. The Government of India purchased it in October 1948 with a view to fit it in the system of New Assam Link Project. This narrow gauge line was extended from Siliguri to New Jalpaiguri in 1962. Since Independence, Indian Posts & Telegraphs Department has made pioneering efforts in promoting philately through exhibitions. To celebrate the centenary of Indian postage stamp, the first International Stamp Exhibition was held in New Delhi in 1954. The first national exhibition was held in 1970 in New Delhi, the second in Calcutta (1975) and the third one at Banglore (1977). An International exhibition, INDIPEX 73 was held in New Delhi in 1973. The first international exhibition under the aegis of the Federation Internationale de Philatelie was INDIA 80, held in New Delhi in 1980. The first and perhaps the only all Asia exhibition, ASIANA 77 was held in 1977 in Banglore. Besides these national and international exhibitions, the Postmasters General have been organizing exhibitions from time to time at the state, region and district levels all over the country. 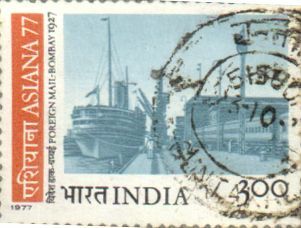 The Fourth India National Exhibition, INPEX-82 was held in New Delhi from 30th December 1982 to 5th January 1983 by the P & T Department, in co-operation with the Philatelic Congress of India. To mark the occasion, Indian Posts & Telegraphs Department issued a set of two stamps. The 50 P. denomination stamp, designed by C.R. Pakarashi, shows a vintage four-wheel composite rail coach comprising Railway Mail Service Van in the middle with passenger sections on either side. 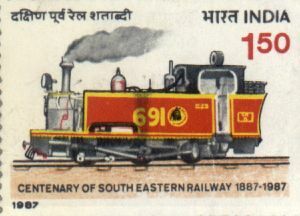 An early steam engine of Indian Railway is shown in silhouette. 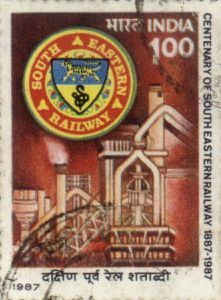 Centenary of South Eastern railway. The South Eastern Railway had its beginning 100 years ago when its predecessor, the Bengal-Railway Co., a company formed in London, signed a contract with the Secretary of State in Council in India to take over the meter gauge Nandgaon Nagpur line on 9th March, 1887. Subsequently, the Kanti-Umaria line, now in the then Central Province, was taken over by this Railway and the Nagpur-Chattisgarh Railway converted to broad gauge. In the next ten years, this railway came up to Calcutta, which was then declared as its headquarters and also up to the coalfields of Bengal -Bihar with a line connecting Asansol in the then East India Railway. The Bengal-Nagpur Railway was brought under direct State management on October 1, 1944 on the expiry of all contracts between the companies and the Government. After Independence, the Bengal-Nagpur Railway was merged with the then East Indian Railway and one zonal railway unit was founded with headquarters at Calcutta. This was found to be unwieldy and on 17th June 1955, the then Railway Minister, Sri Lal Bahdur Shastri announced the separation of old East Indian Railway and Bengal-Nagpur Railway as two separate zones with headquarters of both in Calcutta. The old Bengal-Nagpur Railway sections constituted the South Eastern Railway. SER connects Calcutta with Bombay and Madras. This Railway extends up to Nagpur on the Bombay route, a distance of 1132 kms, and Waltair on the east section to Madras, a distance of 879 kms. 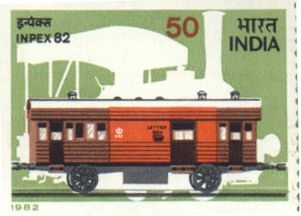 The 150p stamp depicts an early meter gauge steam engine 0-6-4T, No. 691. 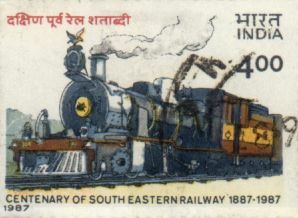 The 400p stamp features the early broad gauge 2-8-2 steam engine of 1890. 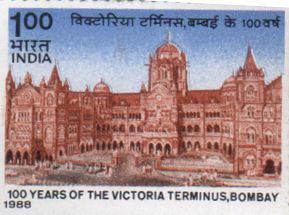 100 years of Victoria Terminus, Bombay. The Great Indian Peninsula Railway constructed the administrative headquarters of the Central Railway known as Victoria Terminus Station building in 1888. The chief engineer of the Railway was Mr. Wilsom Bell Mice, and the building was constructed under the guidance of Mr. F.W. Stevens, consulting architect. The building, which took 10 years to complete, is in late Italian Medieval Gothic style, and was named Victoria Terminus in celebration of Queen's Golden Jubilee on June 20, 1887. Well-proportioned, ornamental arches and spires and domes, give it the dignity of a cathedral. The crowning point of the whole building is the central dome carrying at its apex, a colossal 16'6" high figure of a lady pointing a flaming torch upwards in her right-hand, and a spooked wheel low in the left-hand, symbolizing 'Progress'. This dome has been reported to be the first octagonal ribbed masonry dome that was adapted to an Italian Gothic style building. The construction of the interior of the dome is entirely open, and exposed to view from the ground floor, and the dome-well which carries the main staircase, has been artistically decorated. On the facade are also large bass-relief of 10 Directors of the old Great Indian Peninsula Railway Company two of whom were Sir Jamsedji Jijibhoy and Sir Jagannath Shankarseth. Old records show that most of the bass-relief and some of the statuary was executed by Indian Craftsmen, and students of the Bombay School of Arts, from models supplied and designed by an Indian teacher. Only the statues denoting 'Progress', 'Engineering & Science', 'Shipping & Commerce' and 'Agriculture' were sculptured in England out of Indian Porbunder sandstone. The entrance gates to Victoria Terminus carry two main gate columns, which are crowned, one with a Lion (representing the United Kingdom) and the other with a Tiger (representing India), both sculptured in Porbunder sandstone. Victoria Terminus Station building has been considered one of the finest stations building of he world, and architecturally one of the most splendid and magnificent late Italian Medieval Gothic edifices existing. In 1969 the statue of Progress was damaged due to lightning, but the Central Railway authorities with the help of Prof. V.V. Manjrekar of J.J. School of Arts successfully restored it.